Two of my favorite party scenes are from 'The Great Gatsby' and 'Breakfast at Tiffany's'. Holly Golightly and Gatsby are both examples of the perfect host. Why? Because both characters take a back seat to the guests. They are the invisible force that allow people to have fun. When Holly walks through the party with the toga she isn't the center of attention yet, her act gives people an example of comfort so they can be themselves. Both hosts allow people the freedom to to ensure while maintaining control behind the scenes. In 'The Great Gatsby' the party was a scene in a movie where Gatsby was the writer and director. Everything was in place for the party to be a 'roaring' success. When a Sophisticate is a host, she sets the scene for her guests to have the most amount of fun. Etiquette when hosting a party has more to do than just having manners and politeness, it has everything to do with having passion. It is her energy that sets the tone for the party. The host is the heart and soul of a party. A Sophisticate is the person whose energy the whole party turns around. If she is nervous, the guests will pick up on that and will never relax. For a party's success a Sophisticate exudes confidence and energy. Not by being obnoxious but making sure that she keeps the conversations with the people light and fun. Full of laughter and gaiety. 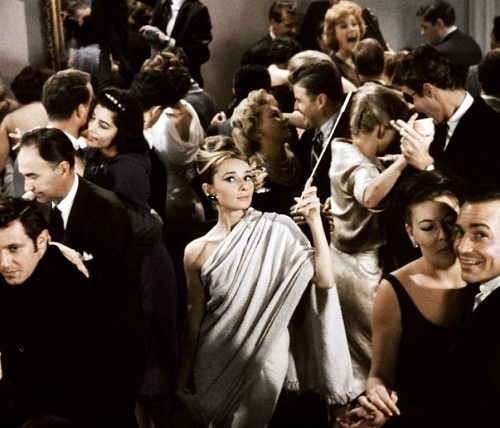 Even if a Sophisticate has to, like Holly Golightly, she dresses in a toga to exemplify the way she wants her guests to behave. Beyond that the basic idea that a Sophisticate remembers or makes sure she knows every guests name, she remembers that is the one person that knows everyone. Therefore, it is her job during the party to make sure that everyone is introduced. A party is also about networking whether it be for business or pleasure. A Sophisticate wants to connect the people she loves most so that her intimate circle gets closer not grows further apart. She attends a party to network (See Sophisti-Etiquette Tip 2: Attending a Party) not the other way around. In the end, a Sophisticate takes Dale Carnegie and utilizes the fact that a person's name is the sweetest sound to make sure her guests have a great time. She never overlooks that the details are important. Although, the odds are that people will forget the details, she realizes they are still important for setting the stage and overall tone of the party. For example, something as simple as a heart shaped lollipop provided during a Valentines Day party provides something fun and innocent for those who don't drink. The same lollipop if provided at the end provides a 'sweet' reminder of a great time. In the end, a Sophisticate provides details to a party not for them to be recognized but as trinkets or accessories to hopefully a few hours that will be worth remembering in the future.